• Resistant to High Temps. Graphite packing is a highly resistant sealant used in systems with valves, faucets, and stuffing boxes, as well as other machines with watertight mechanical parts. It can be applied either to static valve stems or to moving joints. Graphite packing offers high chemical resistance, great lubricity, and excellent thermal conductivity. It is the choice of many industries because it is a reliable, cost-effective, and easy-to-install sealant. Most graphite packing strings are made from large numbers of graphite filaments that are combined by twisting them together. The resulting graphite packing string is called a "yarn". These yarns are then braided to increase their tensile strength and durability. After braiding, manufacturers coat the yarns with agents such as PTFE to further increase their chemical resistance. Lastly, blocking agents are applied to the braided packing to effectively seal the filaments and enhance the packing’s overall seal ability. Because of graphite packing’s famed resistance to chemicals and extremely high temperatures, it is widely used in industries that process acids and oils. Its resilience makes it the perfect sealant for the fuel, chemical, and gas industries. 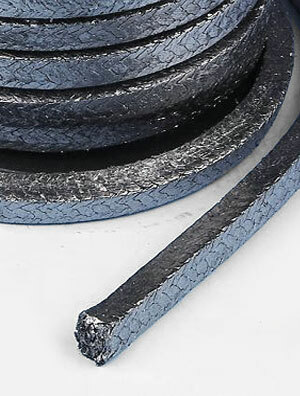 Refineries are able to significantly cut down on the costs of machinery maintenance because graphite packing can last indefinitely and is known to provide excellent protection to valves. It is self-lubricating and almost entirely non-abrasive, making it the preferred packing option for anyone who wants to achieve the most efficient seals and protection for their valves. Hoffmeyer carries a variety of premium-grade graphite packing options to meet your needs. Our products will give you high-quality seals for your valves, agitators, mixers, fillers, and rotary shaft pumps. Our braided graphite packing provides a high-quality seal combined with the maximum mechanical stability for your machinery. Hoffmeyer has 90 years of experience in the industrial supply business. Our trained experts will help you find exactly the type of graphite packing you require. Feel free to contact our experts right away for help in the ordering process.